I have been on a kick to craft with items I find within the house. I especially enjoy finding new uses for things, such as nail polish, baby oil, and even tennis balls. Your kids can get involved in this activity, which is a great way to teach children about recycling. 1. Chair and desk protectors. My daughter's old school used to require that eight tennis balls be brought in each year. Turns out you can cut an X pattern in the tennis balls and put them on the ends of chair and desk legs. This prevents noises that distract from the daily lessons and offers protection for the floor from scratches. 2. As a pen holder. Cut one slit in the end of the tennis ball. You can then keep it on your desk to hold pens, pencils, paper clips, toothpicks, or any other small stationary item. 3. A goofy character. My kids just wanted to make use of their markers and turn the tennis balls into funny characters. I say purchase a bottle and let your kids have fun. They can turn the balls into Smurfs or Angry Birds. Whatever makes them happy. 4. As a way to give a financial gift. Have an upcoming birthday to attend? 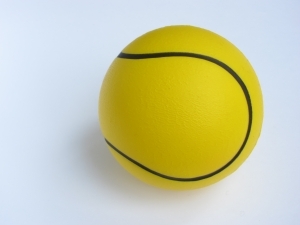 Consider hiding money inside a tennis ball and wrapping it up as a gift. Everyone will laugh when the figure out that you weren't just gifting an old tennis ball. 5. A homemade massager. Place three tennis balls inside an old tube sock. Tie a knot in the sock at the open end to prevent the balls from falling out. Use the item to massage a person's back.